New plans for a controversial composting plant in South Gloucestershire have been submitted. 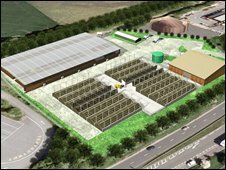 Waste company Sita originally wanted to build the in-vessel composting (IVC) unit near the M4 between Pucklechurch and Westerleigh. But the scheme which led to a campaign of opposition from residents, was revised after an alternative brown field site was identified. An application has been put forward to develop the plant at Tormarton. If approved, the facility will divert 30,000 tonnes of biodegradable waste - made up of green, card and food waste - from landfill each year, the company said. James Pike from Sita said: "The IVC has the added benefit of producing high-quality compost. "The site was previously used for highways maintenance purposes and has good road links, with very few immediate neighbours. We think it is ideal for an IVC facility." Villagers in Pucklechurch and Westerleigh opposed the original plans, claiming the plant would be a blot on the landscape and pose a health risk. Campaigners have now put up signs near junction 18 of the M4 at Tormarton, calling for the application to be rejected.